"Majestic Twelve" is only $17.50CAN including taxes and mailing costs! Finding your tastes headed towards a darker vein of music? 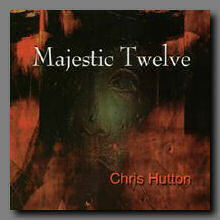 If this is the case for you, may I suggest "Majestic Twelve" by Chris Hutton? Presented as a single track, this long form meditation on dark ambience is a chilling work comprised of a number of movements, each creating it's own unique environment. Sure to appeal to fans of Submarine Fleet or Lustmord, "Majestic Twelve" is a dark delight that opens strange doors that you'll never close again.